After couchsurf #3, we spent one night in a motel in Caen. Then off we drove to Arras, in the north of France, close to Belgium. I’ll keep this one short and sweet because I have already blogged several times about this family. You can read about their (certifiably) insane generosity here. IMHO, a great post worth reading. Thank-you, Onlyboy, for taking this photo. A thick, warm and comfortable homemade hat. I knit this hat in Cascade Yarns Lana Grande. This yarn is 100% Peruvian Highland Wool and quite chunky. I am happy with the way this hat turned out because I think it suits Arrassurfer perfectly. She is blonde with a big personality and a lot of warmth, kindness and character. 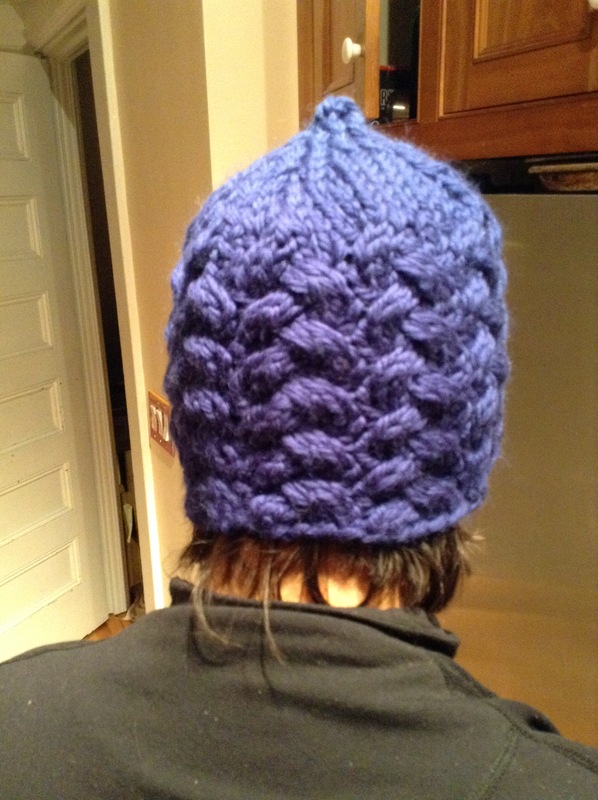 The hat is dark blue, knit on large (9 mm/US#13) needles with a distinctive pattern. This pattern, “Sweet Hat”, was a lot of fun to knit and can be found for free at Cascade yarns. Note, I decided not the make the pom pom. The hats just get better and better. I would buy one of these just for the pattern name “sweet hat”.